In the back of Seiko watches there is a range of information presented. This can tell you the movement type, date of manufacturer, how to open the case, which company produced the product, what the case is made from and the specific case design code. These codes are also occasionally stamped on the inside of the case back while the external surface remains clean. 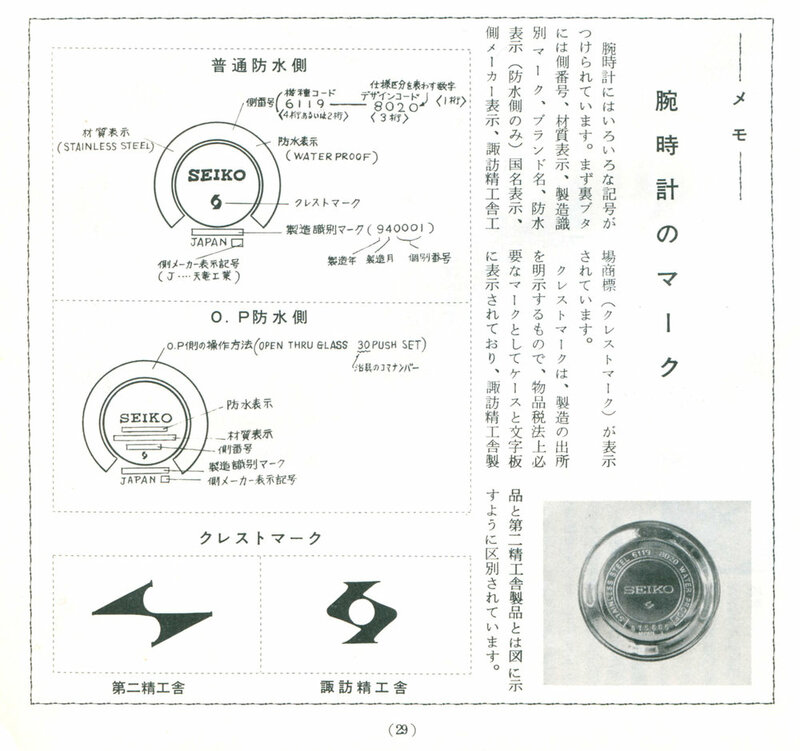 The details on the back of Seiko watches have changed over the years but much of the general information presented have been consistent since the early 1960’s. The information on case backs were detailed in the 1969 Let’s Go Suwa No. 160 internal company magazine. This was a publication for the Seiko Suwa factory that was produced from the late 1950’s to the 1970’s. In the article they describe the different details that were shown on the case backs at that time. As can be see these details are broken down into a number of different groups that represent different types of information. Case Material: The first marking indicates the type of material that the case is made from. This is commonly stainless steel but may also specify a range of different materials e.g. ACRP, SGP, CAP GOLD. 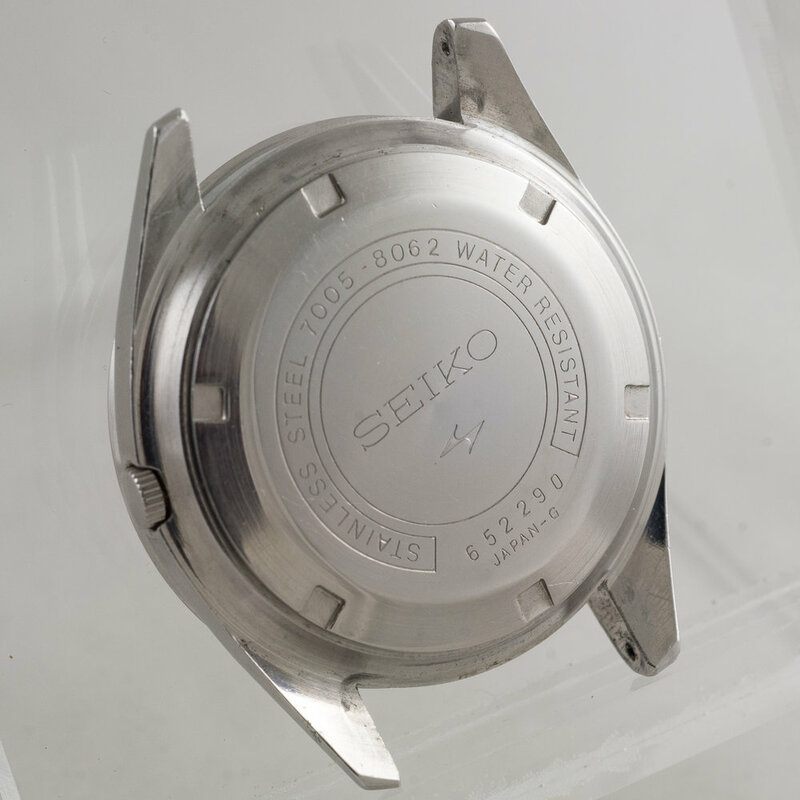 A listing of the different material codes can be found here – Seiko Case Material Codes. Case Number: The next useful group of data is the Case Number. This is broken down into two sections; the first is a 2 or 4 digit Caliber Code (movement number). This is separated with a dash to the Design Code (case type). The design code is unique when used in combination with the Caliber code. For example the case number 8000 used for the 5740-8000 is a completely different design to the 8000 case used with the 6105-8000. The 4th digit in the case number is also used to differentiate the models. The last number can indicate different distribution regions or also can represent different revisions of the case design. 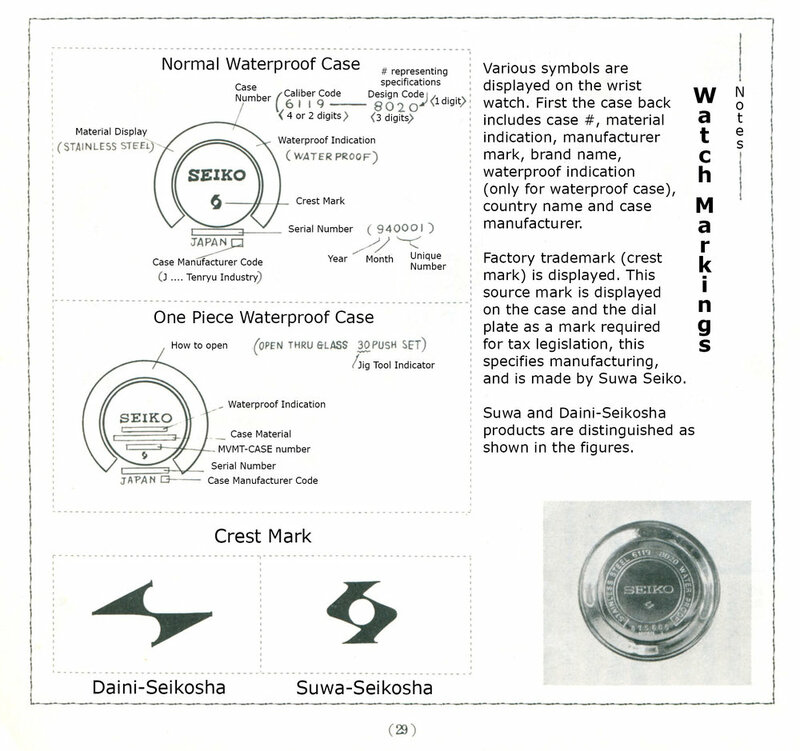 The watch case number can be cross referenced with the Seiko JDM catalogs. You can see the design code listed below the watch. There are a pair of numbers presented inside < brackets >. The first number is the case design code and the second is the dial code. Initially the catalogs did not list the specific caliber number for all models but this was introduced in the 1976 catalog. Below are some examples from various JDM catalogs. Water Proof: The obvious marking is present if the case is stated to be waterproof. This marking changed read Water Resistant or simply Water Resist in around 1970 due to legislation changes in the US market. By 1971 almost all models had changed from Proof to Resist markings. For some waterproof models opening instructions are included on the case back. This is usually for one piece cases and they will often state the external size of the crystal so you can identify which die to use in a Seiko S-14 one piece case opener. Here are the case back examples shown in the S-14 tool manual, the tool and manual can be seen here. Company Crest: Positioned below the Seiko branding the crest mark indicates the watch production company and this is either the Daini “lightning bolt” or the Suwa “typhoon”. This same logo will also appear on the watch dial. Serial Number: The serial numbers on modern Seiko models are comprised of 6 digits. The first digit indicates the year, the following character the month and the remaining 4 digits a unique production number. The month is listed as 1-9 for January to September, then 0 for October, N for November and D for December. For example on this case number of 7005-8062 the serial number is 652290. This indicates the example was manufactured in May 1976 and the unique production number is 2290. Exactly how this production number was allocated between models and production runs is not clear. As the year is only comprised of the single digit, to determine the relevant decade the model is from you need to know the period that the watch was released. This can be determined by the calibre number, as most movements were not produced for longer than a decade. For movements that were produced for a long period of time they often go through various revisions and are marked with a version letter like A, B, C etc at the end of the general calibre e.g. 7S26C. Other clues to the model decade can be the watch styling or branding, for example Seiko Advan models are associated with the 1970’s. The six digit serial numbers are found on Seiko models beginning from 1966. Previous to this Seiko used a seven digit serial number with a similar format. This seven digit serial number continued until 1969, so there is a transition period where some models had a six digit serial and other models a seven digit. While most of the seven digit serial numbers followed the Year, Month, Production # format there are some examples that seem to follow a Month, Year and Production # format. If you want to confirm the production date on a specific model there are a number of online calculators available. You just enter your watch serial number and caliber number and the date will be calculated. A comprehensive date calculator can be found here - SEIKO - Serial Number to Manufacturer Date Decoder. There are some error on this site but in general it is quite reliable. Case Manufacturer Code: The final item on the case back is the country and case manufacturer mark. On the 7005 example above it is listed as Japan-G, but there are numerous other case manufacturer codes. The most commonly seen are Japan-A and Japan-J but Japan-X and Japan-S are also seen. It is not clear if these codes directly relate to a case supplier e.g. all Japan-A models come from the same supplier, or if these are similar to design codes where the code is specific to the model e.g. Japan-J can indicate a different manufacturer for model A vs model B. The case back format described so far continues today with the same general format but there has been a change in the layout and some additional information added over time. Case Construction Mark: One of the additional items added to the case back format was a case construction mark. Initially this was an additional letter that was included at the end of the case number and later moved to waterproof section. This separate casing letter was changed to one or two characters enclosed in a box in the late 70’s. The first character indicates the basic construction of the case and if present the second digit represents the deviation from the standard construction. 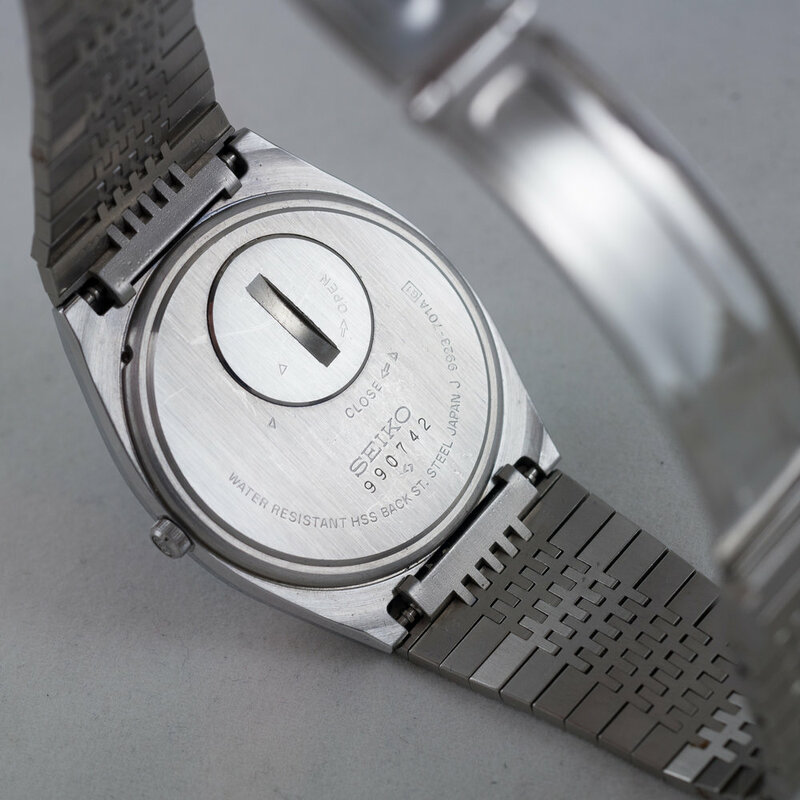 Details of this case construction mark can be seen in the 1982 Seiko Case Servicing Guide. This guide outlines how the cases are opened and the case construction mark details how the crystal is changed. Click here to download the 1982 Seiko Case Servicing Guide. Magnetic Resistance: Another case marking that has been added to some watches indicates magnetic resistance. This is represented as a horseshoe magnet and can have either a single or double bar under it. The single bar indicates standard magnetic resistance while the double is for enhanced resistance. I am not aware of specific values represented by either of these symbols but would assume that they refer to at least exposure to a direct current magnetic field of 4,800 A/m as per ISO 764. Battery Change Index: On many Seiko quartz divers there is an outer series of markings that are there to indicate when battery changes have been made on the watch. The markings will indicate the year number and this is divided down into quarters. When the battery is fitted at the factory the first suggested battery change time will be marked on the case. This is shown as a round punch mark above the relevant quarter of the year the change is expected to occur. On the example above the first battery change is indicated to occur in the second quarter of 2014. You can see the batter change gauge index circling the case back and it ranges from 2014 to 2024. Service Battery Markings: On some divers there will be a five character stamped code on the back. These marks are often incorrectly identified as some kind of military marking or similar but a much these are due to a much simpler explanation. 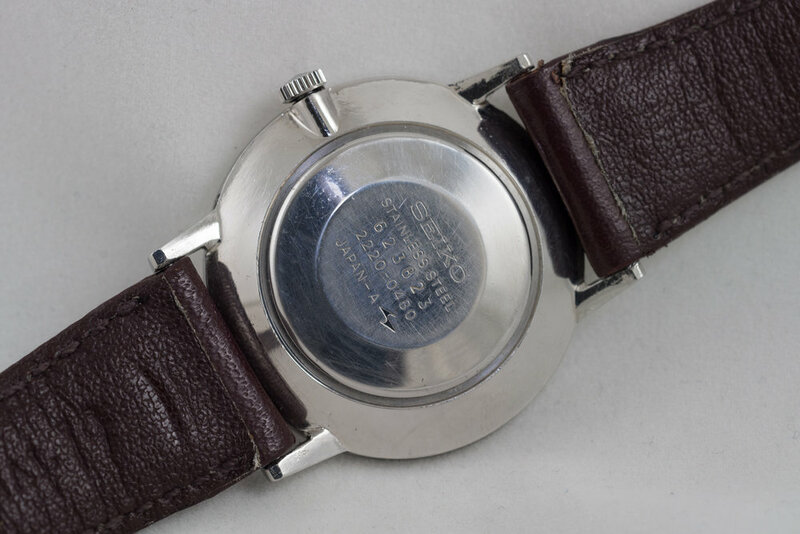 Once the years indicated on the battery change index has expired Seiko service centers will often stamp the case back when the new battery is exchanged. This is done in the format BYYMM, where B stands for battery, YY indicates year and MM indicates month. You can see multiple markings on a watch that has undergone multiple battery changes. On the example above you can see that the watch had suggested battery changes at second quarter 1988, first quarter 1995. As the battery change index finishes in 1997 a service marking had to be made in April 2001 (B0104) and another in February 2004 (B0402). Case back Examples: Here are a couple of examples of different case backs and the information represented on them. This watch obviously has a stainless steel case. The serial number indicates the watch was produced in February 1976 and has a unique production number of 3823. It has a 2220 caliber with a case design code of 0430. The case was produced by manufacturer A and the watch came from Daini-Seikosha. This watch is water resistant. It has a case construction code of G and is made from stainless steel. 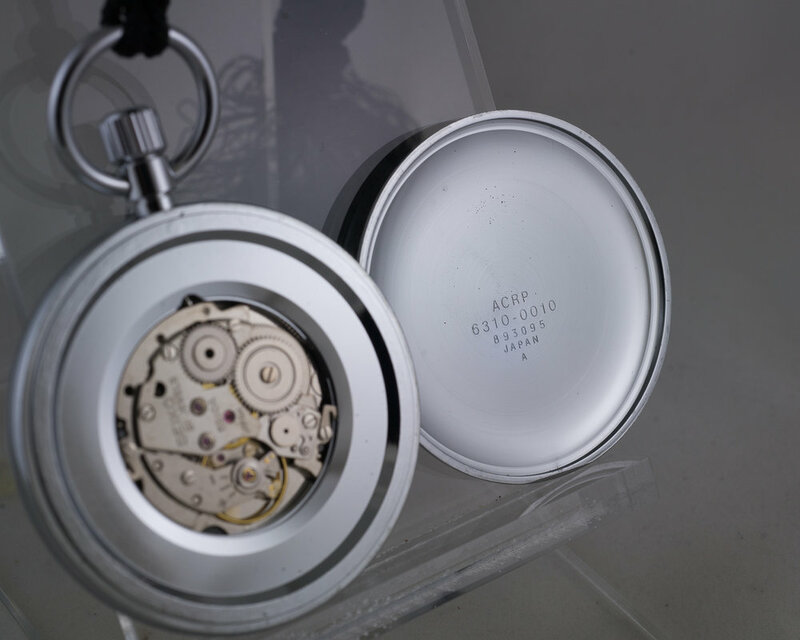 The case came from manufacturer A and is fitted with a 0903 caliber movement in a 8110 design case. The serial number indicated it was produced in October 1976 and has a unique production number of 7536. The watch was produced from Suwa-Seikosha. This watch as an all chrome plated case. It has a 6310 caliber movement and a case design of 0010. The serial indicates the watch was produced in September 1978 and has a unique production number of 3095. This case came from the A manufacturer. The watch is water resistant. It is made from hard stainless steel with a hardness value of approximately 450 with a stainless steel case back. It came from case manufacturer J and has a 9923 caliber. The case design code is 701A and it has a case construction mark of G1 indicating the first variation of a G type case. The serial number indicates a September 1979 manufacturing and has a unique production number of 0742. It was produced by Suwa-Seikosha.